When this card appears in a reading it can mean that relocation is imminent. With relocation comes change and challenges, but there is much that is positive about this too. Ibn (pronounced Iben) Battuta, born in 1304, was a Muslim from Morocco. He wanted to travel to Mecca, a pilgrimage that is required in the Islamic faith. This was long before steam trains and many other means of transport was available. Ibn’s only mode of transport at the time was by foot, on camel or horse back, or by sea on one of the explorer vessels. He travelled a distance of about 75,000 miles, lasting 29 years. A journey that he started at the age of 21. His travels took him from Morocco, up and down the coast of Africa, to Egypt, Arabia, Russia, India and finally to China before he made his way back to Morocco again. During his travels he dined with nobility and peasants, he became super wealthy and lost it all again, he had encounters with pirates, kings and everything in between. He even managed to evade the black plague. In short, he led a full life in the act of relocating from one area to the next. Doing what was unheard of for the time, and never pausing for long enough to allow the fear of the unknown to thwart his efforts. If Frank Sinatra knew him he would surely have dedicated his son ‘My Way’ to Ibn Battuta. Many of us are intimidated by change. Relocating from our familiar surroundings, be that our home or our job, our state or even our country can be a frightening and intimidating experience for most of us. However, we could take a page out of Ibn’s book and LIVE the experience instead of shying away from it. We will collect gems along the way, and we will lose some along our travels. We’ll meet people from all walks of life, many of whom will add riches to our experience. By welcoming change and the occasional prospect of relocating when the opportunity arises we effectively are welcoming the act of momentum into our lives rather than the inaction of stagnation. This movement can come in many forms, breathing new life into our relationships for example, by taking action together and welcoming change can be one such way. Imagine taking our relationships to another level where we allow ourselves to embrace the possibilities that placing one step in front of the other on a sometimes-rocky road. This can give us joint purpose and a meaningful shared experience. Instead of shying away from the ‘rough patches’ in relationships, holding onto one another’s hands and trusting that our partner will pick us up when we fall, dust us off when we eat dirt, and that we will do the same for them. For, the road isn’t always rocky or perilous, there will be times that we will share a sunrise together and bask in its glow, happy that we have someone to share the moment with. Other times when we feel joyfully overwhelmed by the sheer richness and beauty of the journey. 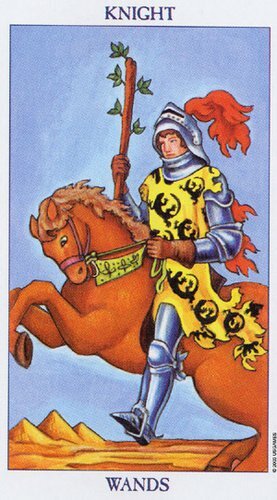 When the Knight of Wands appears for us as it has done today, we might want to ask ourselves what aspects of our lives we could inject a bit of momentum into, banish stagnation from, and even welcome the challenge and change that the motion of action promises us.